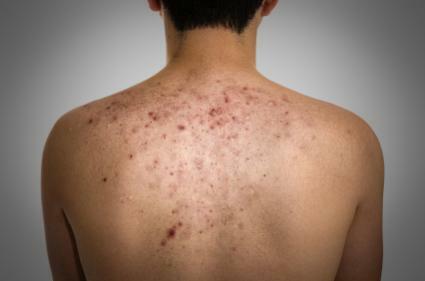 If you suffer from body acne, you may be looking for effective treatment options. Like facial acne, breakouts on the body can be treated with over-the-counter or prescription medicines. Acne usually occurs for the same reasons, regardless of location on the body. Skin pores contain oil-producing glands called sebaceous glands. The oils these glands release help keep skin moist and supple. At the same time, skin is constantly renewing itself and shedding cells from its top layer. If sebaceous glands become clogged with dead skin cells, they become a breeding ground for bacteria. The combination of too much oil, clogged pores, and bacteria leads to the development of acne. Most of the time, pimples on the body are a type of acne called acne vulgaris. "Vulgaris" doesn't refer to anything scary - it's just a medical term for "common." Anyone can get body acne. It's most common in teens, who are also the most likely to have facial acne. The hormonal changes during puberty cause changes in the skin, including an increase in oil production. The changes can happen not just on the face, but also on the chest, back, and elsewhere. Unfortunately, acne doesn't always disappear after puberty is over. Adults in their 20s, 30s, and older can still get breakouts. The hormonal changes of pregnancy can also lead to outbreaks. Benzoyl peroxide, which helps dry up oil and kill bacteria. Salicylic acid, which helps keep pores clear. Resorcinol and sulfur, a combination which both reduces oil and keeps pores from clogging. Alcohol or acetone, which dry out skin. Salicylic acid is available in several anti-acne shower gels. These gels make it easy to use the medication on your chest, back, and other affected areas. They're meant to be used just like soap, lathered on in the shower and then rinsed off. Sometimes, over-the-counter body acne treatments just do not do the trick. Cystic acne is especially difficult to treat on your own. In this type of acne, large, pus-filled cysts form deep beneath the skin. The cysts become inflamed and sometimes painful, and the skin looks red and bumpy. Treatment for severe acne requires a visit to the doctor. The doctor may prescribe an antibiotic cream, a retinoid cream (which helps keep pores clear), or a benzoyl peroxide preparation. Cystic acne requires antibiotics that are taken by mouth, as well. Birth control pills reduce acne in many women. Don't wear clothing that holds moisture and doesn't "breathe." Body acne tends to get worse when sweat can't evaporate. Do wear cotton and other breathable fabrics. Don't use oily moisturizers or cover-up creams. Do look for oil-free cosmetics. Be careful not to scrub too hard, and don't use harsh brushes or rough cloths on your skin. These things can make acne look worse. Never pick at acne, and don't squeeze pimples. These things can lead to infection or scarring. Do wash skin with gentle cleansers, twice a day. If you'll be out in the sun, do look for high-quality sunscreens that are oil-free or labeled "non-comedogenic," meaning they won't clog pores. If you are dealing with acne, first try these tips to help reduce the conditions that cause breakouts and treat any pimples with over-the-counter solutions. However, don't be hesitant to consult with a dermatologist if the condition doesn't respond or if it is extreme or painful as you may need medical skin care.